In 2018, we took great pride in our collaboration with Diomcoop a cooperative founded and managed by 15 street sellers in Barcelona. 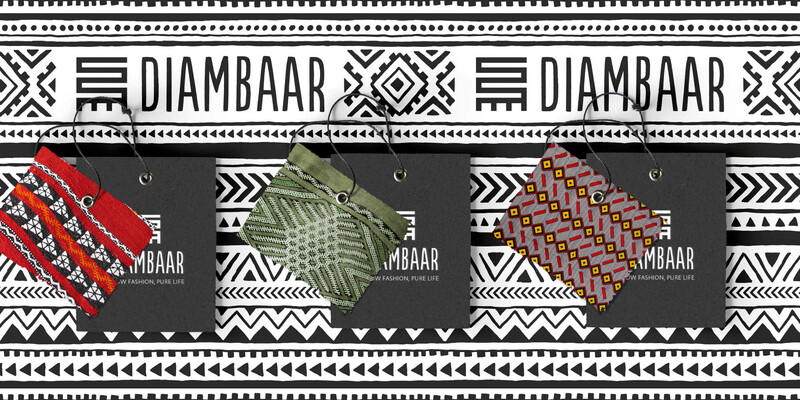 Logic Design Barcelona and Diomcoop co-created Diambaar, an African-inspired clothing brand that aims at helping more people in a vulnerable situation. Two years ago, the Barcelona City Council and Barcelona Activa started working on a solution to the unauthorized street selling issue. Diomcoop was born from that thinking: a pioneering cooperative organization founded and managed by 15 Sub-Saharan street sellers who are now able to regularize their situation and build their own future. One year later, Diomcoop went one step further. The founding members decided to launch their own African-inspired textile and clothing line with the idea to include more and more people in vulnerable situations in the cooperative. To achieve this ambitious goal, Diomcoop and the technical advisory team needed to work on the creation of an appealing brand that would combine modernity and aura. The Logic Design team was asked to help. We gladly accepted the challenge! We first needed to align on a common vision of what the brand would stand for. Also, we knew it would be essential to understand the situation of the street sellers, their cultural mindsets and differences to successfully tailor the project. We based our approach on our design thinking process, to be both agile and collaborative. We started by immersing ourselves into Diomcoop’s world to fully understand how the cooperative works. We interviewed the technical team as well as their partners. To build a consistent brand story, we compiled reports and media coverage about Diomcoop, we visited their stalls on several street markets around Barcelona and we analyzed the market. Their strong points were obvious: the colors and quality of the clothes were appealing, their partners were spontaneous and cheerful… and that was just what they wanted their customers to feel! To create positioning expressions and come up with a name and a claim, we gathered the whole team for a few workshop sessions. Everyone needed to be part of the creative process and feel that the results were the direct consequence of their ideas, commitment, and effort. From these workshops, the idea of a name in Wólof arose. We tested a couple of names on potential consumers who reacted in very different ways but revealed two key drivers of attraction: sense of fashion and social concern. Diambaar, which means brave in Wólof, was born. We added the claim “Slow fashion, pure life”, an invitation to buy and live with joy and awareness without haste. The brand combines wax patterns and European style. Their production is anchored in a social and solidarity economy and they work with African artisans and sellers together with other social initiatives in the city. After the name and claim were approved by the team, we developed the brand platform and manifesto and designed its visual identity. We took our inspiration from original African symbols and combined them with a modern graphic style. We officially launched the brand during their first fashion show in the patio of Museo Frederic Marès in Barcelona, where they presented the 26 pieces of the Spring-Summer collection. It is too early to have tangible results yet but Diambaar has already attracted great media coverage without a communications campaign. Famous Spanish media such as El País, La Vanguardia, El Periódico, Ara or Betevé have covered Diambaar’s story. More importantly, Diambaar illustrates how branding can add value to social economy initiatives.